XXI. 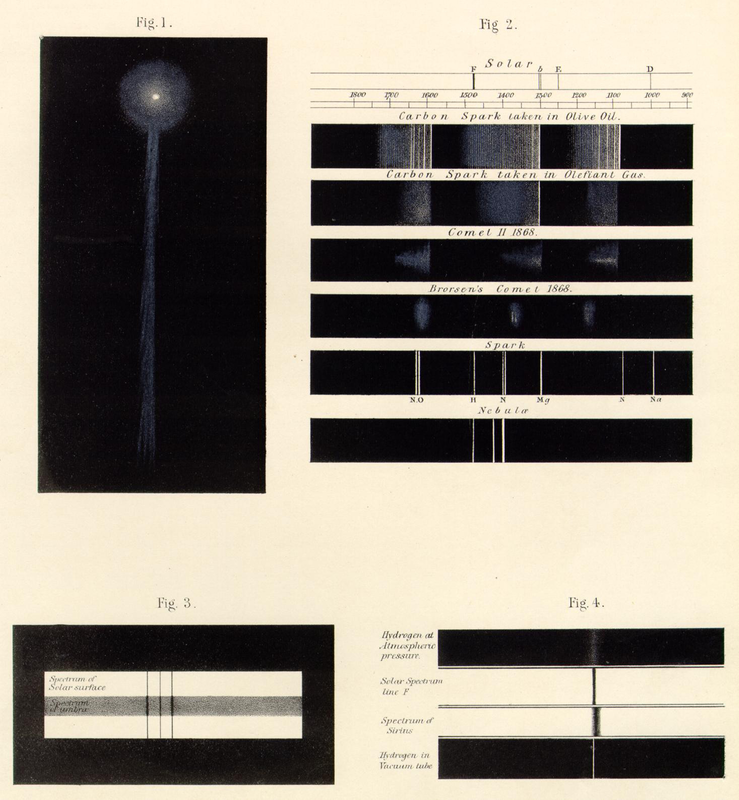 Further Observations on the Spectra of some of the Stars and Nebulae, with an Attempt to determine therefrom whether these Bodies are moving towards or from the Earth, also Observations on the Spectra of the Sun and of Comet II., 1868. By William Huggins, F.R.S. Received April 23*,—Read May 14, 1868. 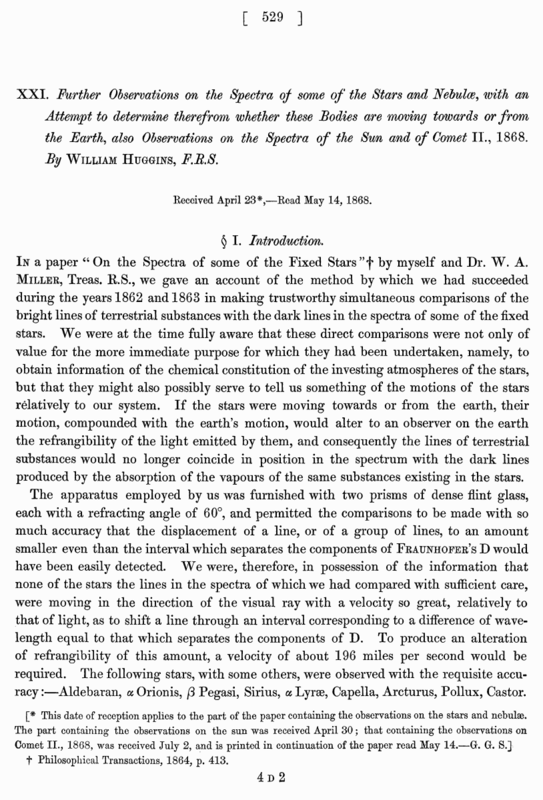 In a paper “On the Spectra of some of the Fixed Stars ”f by myself and Dr. W. A. Miller, Treas. R.S., we gave an account of the method by which we had succeeded during the years 1862 and 1863 in making trustworthy simultaneous comparisons of the bright lines of terrestrial substances with the dark lines in the spectra of some of the fixed stars. We were at the time fully aware that these direct comparisons were not only of value for the more immediate purpose for which they had been undertaken, namely, to obtain information of the chemical constitution of the investing atmospheres of the stars, but that they might also possibly serve to tell us something of the motions of the stars relatively to our system. If the stars were moving towards or from the earth, their motion, compounded with the earth’s motion, would alter to an observer on the earth the refrangibility of the light emitted by them, and consequently the lines of terrestrial substances would no longer coincide in position in the spectrum with the dark lines produced by the absorption of the vapours of the same substances existing in the stars. The apparatus employed by us was furnished with two prisms of dense flint glass, each with a refracting angle of 60°, and permitted the comparisons to be made with so much accuracy that the displacement of a line, or of a group of lines, to an amount smaller even than the interval which separates the components of Fraunhofer's D would have been easily detected. We were, therefore, in possession of the information that none of the stars the lines in the spectra of which we had compared with sufficient care, were moving in the direction of the visual ray with a velocity so great, relatively to that of light, as to shift a line through an interval corresponding to a difference of wavelength equal to that which separates the components of D. To produce an alteration of refrangibility of this amount, a velocity of about 196 miles per second would be required. The following stars, with some others, were observed with the requisite accuracy :—Aldebaran, a Orionis, j3 Pegasi, Sirius, a Lyrse, Capella, Arcturus, Pollux, Castor. [* This date of reception applies to the part of the paper containing the observations on the stars and nebulae. The part containing the observations on the sun was received April 30; that containing the observations on Comet II., 1868, was received July 2, and is printed in continuation of the paper read May 14.—G. Gr. S.J t Philosophical Transactions, 1864, p. 413.